The Israel Defense Forces (IDF) was responsible for serious violations of the laws of war during its conflict with Hezbollah. Israeli attacks in Lebanon resulted in the deaths of at least 1,109 Lebanese, the vast majority of whom were civilians. This report is based on in-depth investigations of over 94 separate cases of Israeli air, artillery, and ground attacks that claimed 510 civilian lives and 51 combatants, or nearly half of the Lebanese deaths in the conflict. Human Rights Watchs research shows that the primary reason for the high Lebanese civilian death toll during the conflict was Israels frequent failure to abide by a fundamental obligation of the laws of war, the duty to distinguish at all times between military targets that can be legitimately attacked, and civilians, who are not subject to attack. This was compounded by Israels failure to take adequate safeguards to prevent civilian casualties. Our research into more than 94 attacks shows that Israel often, even though not deliberately attacking civilians, did not distinguish between military objectives and civilians or civilian objects as required by humanitarian law. The chief cause of this wrongful and deadly selection of targets was Israels assumption that Lebanese civilians had observed its warnings to evacuate all villages south of the Litani River, and thus that no civilians remained there. As a result, Israel targeted any person or vehicle south of the Litani River on the grounds that they were part of the Hezbollah military apparatus. Israel also engaged in widespread bombardment of civilian areas that was indiscriminate, which endangered many of the civilians who had remained behind. In addition, in the Dahieh section of southern Beirut, this danger of this presumption was compounded by the Israeli tendency to treat all people and buildings associated with Hezbollah, however vaguely, as legitimate military targets. Israel must have known from its past conflicts in southern Lebanon that a civilian population is rarely able or willing to leave its homes according to timetables laid down by a belligerent military.160 Reporting 10 years ago on fighting between Hezbollah and Israel during July 1993, Human Rights Watch found that it was reasonably foreseeable that a segment of the population might not flee, and it was entirely foreseeable that in particular the old and indigent would not be able to evacuate their homes, especially considering the brevity of time between the first warnings and the beginning of the shelling.161 In this war, not only were these outcomes foreseeable, they were based on the precedents of Israels previous wars in Lebanon. Israel should have known that civilians would remain in their villages throughout the war and should, at the very least, have modified its targeting practices in light of the reports of increasing civilian deaths. Considering Israels experience in past conflicts in Lebanon and the real time information of civilian deaths streaming through the media, Israels decision to treat southern Lebanon effectively as a free-fire zone would make Israel responsible for indiscriminate attacks on civilians. Commanders who knowingly or recklessly ordered such attacks would be subject to prosecution for war crimes. Even if civilians who remained did so because they were Hezbollah supportersa claim contradicted by Human Rights Watchs research, which found that most of those who remained behind stayed because they were too old, poor, or sickly to leaveIsrael would not have been justified in attacking them. The political leanings of the civilian population in a given area or village is irrelevant as far as their civilian status is concerned. Only civilians who directly participate in hostilities, that is, commit acts that by their nature or purpose are likely to cause harm to the personnel and equipment of the enemy (or provide direct combat support to combatants) are subject to attack. Otherwise they are protected against attack like any other civilian. Despite the many Israeli warnings, a significant number of Lebanese civilians remained in every village in the south. Many were too afraid to travel on the roads, because Israeli attacks targeting persons on the roads occurred on a daily basis, even when those fled immediately after warnings. Others did not have transport to flee, as vehicles gradually emptied out of the south or were destroyed on the roads, or they could not afford the extremely high fares charged by drivers willing to take the risk, often amounting to thousands of US dollars per vehicle. Many of those who stayed behind were too old, infirm, or sick to be moved, and they died in disproportionate numbers from air strikes during the war. And many rural Lebanese civilians had their life savings invested in their homes, livestock, and agricultural fields, and so were unwilling to leave these precious resources behind. After the war, Daniel Carmon, the deputy Israeli ambassador to the United Nations, defended Israels actions in Lebanon by arguing that There is hardly any distinction between Hezbollah and the civilian population [in southern Lebanon]. This whole region was a region in which you could not make the distinction between one and the other.166 In fact, even if it was difficult for Israel to distinguish between civilians and Hezbollah fighters in southern Lebanon because Hezbollah fighters frequently did not wear distinguishing uniforms or bear arms openly, Israel was required by a fundamental obligation of the laws of war to distinguish at all times between combatants and civilians, and to refrain from launching attacks if it could not be sure that it was targeting combatants rather than civilians, or if the anticipated harm to civilians would have been disproportionate to the military gain Israel hoped to achieve. The difficulty of making such distinctions did not negate Israels obligations. The IDF initially issued warnings to the residents of southern Lebanese villages to leave, followed by increasingly urgent warnings for all civilians south of the Litani River to evacuate their homes and head to areas north of the Litani for their safety. However, Israel failed generally to give affected Lebanese civilians a realistic opportunity to evacuate. First, most warnings reviewed by Human Rights Watch did not provide sufficient time for people to evacuate, especially given that most roads in southern Lebanon remained under bombardment. For instance, in Marwahin, the IDF gave only a two-hour warning before a threatened attack and hit a convoy fleeing Marwahin.168 IDF warnings often either gave an unrealistically short time frame for civilians to leave the area, or where so vague as to give almost no indication to the civilian population of how or when they were supposed to evacuate. Second, despite repeated appeals from United Nations and other humanitarian officials, Israel failed to create safe passage corridors for evacuating civilians.169 Israel claims to have created humanitarian corridors during the conflict, but these corridors existed only in northern Lebanon to allow humanitarian agencies the ability to move humanitarian supplies to Beirut and did not extend into the active conflict zone in southern Lebanon. And even these limited humanitarian corridors focused on the movement of humanitarian supplies, not on safe evacuation routes for civilians. The fear that had prevented people from fleeing became apparent when thousands of people took to the road after Israel announced a 48-hour suspension of air strikes starting on July 31. Pay Attention to these instructions! The IDF will intensify its activities and will heavily bomb the entire area from which rockets are being launched against the State of Israel. Anyone present in these areas is endangering his life! In addition, any pickup truck or truck traveling south of the Litani River will be suspected of transporting rockets and weapons and may be bombed. You must know that anyone traveling in a pickup truck or truck is endangering his life. Rockets are being fired against the State of Israel from your area. The Israeli Defense Forces will operate at full force against these terrorist groups effective immediately. For your own safety, you must leave immediately, and travel northwards. Anyone who remains is putting himself in danger. As explained above, however, a large number of civilians did remain in southern Lebanon. Many were ill or bedridden, or were taking care of sick or elderly relatives, stayed behind to look after livestock, or simply were too poor to leave. Although these civilians remained inside their shelters for most of the time, on occasion they had to move within their homes and shelters or outside to get food, water, or other supplies. In many instances, Israeli drones and warplanes then struck their shelters after noticing the movement. In many of the instances documented by Human Rights Watch, Israeli air strikes killed civilians soon after they entered or exited a shelter. In all likelihood, the Israelis were not even aware of the number of civilians inside the shelter when deciding to launch an attack, and had made no evident effort to find out. Human Rights Watch documented many similar attacks that appeared to be based solely on the movement of persons or vehicles. For instance, on August 10, Israeli warplanes struck a home in the village of Rabb al-Talatine, killing four women, soon after the women had carried a wounded relative (one of the four women killed) from one home to another home. On August 7, an Israeli air strike killed five civilians in Insar, apparently after they left a home on foot after an evening of socializing. Israels bombardment of southern Lebanon was widespread. Israeli warplanes launched some 7,000 attacks against targets in Lebanon, supplemented by massive artillery and naval bombardments.174 Israeli air strikes completely destroyed or damaged tens of thousands of homes during its bombing campaign. In some villages, homes completely destroyed in the Israeli bombardment numbered in the hundreds: 340 homes completely destroyed in Srifa; 215 homes completely destroyed in Siddiquine; 180 homes complete destroyed in Yatar; 160 homes completely destroyed in Zebqine; more than 750 homes completely destroyed in `Aita al-Sha`ab; more than 800 homes completely destroyed in Bint Jbeil; 140 homes completely destroyed in Taibe. The list throughout Lebanons southern region is extensive. According to many people interviewed by Human Rights Watch, much of this destructionlike the massive barrage of cluster munitions fired into southern Lebanontook place in the final days of the war. Although Israel destroyed many of the homes with precision-guided missiles, there is no evidence of a Hezbollah military presence throughout these villages that would have justified this enormous collateral damage. As explained above, Human Rights Watchs research indicates that the vast majority of Hezbollah rockets and fighters were placed outside these villages. In the vast majority of the cases of civilian homes destroyed by Israeli strikes, the homes were empty, and there were no civilian casualties. However, as mentioned above, many civilians did not leave their villages, and a number of them died inside their houses, their bodies found under the rubble after the end of the war. The widespread bombardment showed little attempt to discriminate between military objectives and civilians and civilian structures. Nor does it seem that proper assessments were made of relative anticipated military advantage and civilian harm. The IDFs own summary of its bombing campaign identifies some 1,800 air strikes, out of a total of some 7,000, that were carried out against Hezbollah-associated structures, a category distinguished from the 300 air strikes carried out against Hezbollah military infrastructure (headquarters, bases, and rocket-launchers).180 While the IDF summary does not define Hezbollah-associated structures, our research indicates that a large number of private homes of civilian Hezbollah members were targeted during the war, as well as a variety of civilian Hezbollah institutions such as schools, welfare agencies, banks, shops, and political offices, in addition to Hezbollah military infrastructure and the homes of Hezbollah combatants. In many of the villages and towns visited by Human Rights Watch, villagers identified the homes of Hezbollah civilian officials, empty at the time of the air strikes, that had been destroyed by Israeli air strikes. Since most civilian as well as military Hezbollah officials evacuated their homes as soon as the war started in anticipation of Israeli air strikes targeting themeven their neighbors often evacuated their homes for the same reasonthe death toll associated with air strikes targeting actual Hezbollah civilian officials is low. The death toll in southern Beirut was also low despite the massive destruction caused by Israeli bombardment, because entire neighborhoods such as the Dahieh were completely evacuated in anticipation of Israeli air strikes. Human Rights Watch did document a few cases in which civilians were killed during air strikes on civilian Hezbollah-affiliated targets during the war. On July 13, the first day of massive air strikes, Israeli warplanes destroyed the home of Shaikh `Adil Muhammad Akash, an Iranian-educated Shi`a cleric believed to be associated with Hezbollah, killing him, his wife, his 10 children aged between 2 months and 18 years, and their Sri Lankan maid. There is no evidence (and the IDF has not alleged) that Shaikh Akash was involved in Hezbollah military activities, and according to villagers he was solely a religious leader in Dweir village. On July 23, an Israeli warplane fired at the Nabi Sheet home of Dr. Fayez Shukr, a former Minister of State (1995-1996), a leading member of the Lebanese Baath Party and a political ally of Hezbollah, killing his 71-year-old father. In most cases in which civilian deaths did occur as Israel attempted to target civilian (or even military) Hezbollah officials, the main reason for the deaths was Israels use of unreliable or dated intelligence that led to the misidentification of a particular building as Hezbollah-related, or Israels failure to take adequate precautions to limit civilian casualties during strikes on presumed Hezbollah targets, particularly the homes of suspected Hezbollah militants. Israels broad definition of legitimate Hezbollah targets is particularly evident in the pattern of attacks on the densely populated southern suburb of Beirut, Dahieh. In their attacks on this largely Shi`ite district of high-rise apartment buildings, Israeli forces attacked not only Hezbollah military targets but also the offices of Hezbollahs charitable organizations, the offices of its parliamentarians, its research center, and multi-story residential apartment buildings in areas considered supportive of Hezbollah.181 Human Rights Watch research did establish that Hezbollah maintained a weapon storage facility in at least one civilian apartment building in the Dahieh, and that armed Hezbollah fighters sheltered together with civilians in at least one civilian basement in the Dahieh, but did not find widespread evidence of such unlawful Hezbollah practices which would have justified the extent of Israeli bombardment of this civilian area. Supplying propaganda for Hezbollah does not make al-Manar a legimitate military target.186 No other information available to us would justify the attack. International humanitarian law forbids direct attacks against civilian objects, such as homes and apartments, places of worship, hospitals, schools, or cultural monuments, unless the building is being used for military purposes, or persons within the building are taking a direct part in the hostilities. 187 Simply because a civilian building may have some association with Hezbollah does not make it a legitimate military target. Even if a legitimate target exists within a building, the attacking party must still make a proportionality assessment, ensuring that the expected value of destroying the military object to be attacked outweighs the likely impact of the attack on civilians and civilian infrastructure. International humanitarian law requires warring parties to do everything feasible to verify that targets are military objectives.188 Israels campaign against presumed Hezbollah leaders and forces failed in its objectives but was a primary cause of civilian casualties in the conflict. Despite destroying or damaging tens of thousands of homes during its bombing campaign, many of them in precision-guided strikes against presumed Hezbollah targets, Israel failed to kill a single national Hezbollah leader and was unable to destroy or neutralize Hezbollah forces. An examination by Human Rights Watch of the circumstances in which more than 150 Hezbollah fighters diedprobably approximately more than half of the total number of Hezbollah fighters killed in the conflictshows that the vast majority died in ground-based firefights with Israeli forces, not in the widespread air strikes on residential areas during the early stages of the conflict.189 By contrast, almost all of the civilians killed during the conflict either died inside homes bombed by Israel or in civilian cars while trying to flee. Particularly at the beginning of the war, Israel used hundreds of precision-guided bombs to demolish homes where Israeli intelligence must have indicated a Hezbollah target. However, in the vast majority of these cases, Israeli intelligence was plainly wrong: the buildings targeted had no Hezbollah presence or links inside. Even during its first bombing raids on July 13, when Israel would have targeted the structures for which it had the strongest intelligence information, Israeli air strikes hit some Hezbollah weapons stores and homes of Hezbollah militants, but also a significant number of homes with no Hezbollah links at all, killing dozens of civilians. This pattern of precision-guided strikes on civilian homes would continue throughout the war, indicating that Israeli intelligence on Hezbollah targets was severely flawed, that the IDF took insufficient action to address the problem, or that the IDF simply stopped caring about civilian casualties after it issued warnings to the civilians to evacuate and wrongfully assumed that those who remained behind were all Hezbollah militants. The most devastating example of a failure to take adequate precautions was the attack on the last night of the war on the Imam Hassan building complex, in the Rweiss neighborhood of southern Beirut. The massive air strike involved an estimated 20 large missile strikes on the housing complex, killing at least 40 persons. Human Rights Watch found no evidence that senior Hezbollah officials were present at the complex or of underground bunker structures during an inspection of the site on October 30, 2006, and witnesses interviewed by Human Rights Watch stated that they did not believe senior Hezbollah officials had visited the complex during the war, or that there was any other Hezbollah association with the complex. The civilian cost of Israels much wider targeting of the entire Hezbollah organization, including its political and social welfare institutions, was much greater than that of the more limited US campaign targeting the Iraqi leadership, but was based on similar faulty intelligence. 156 Human Rights Watch approached Israeli officials on a number of instances: (i) meeting on August 8, 2006 with representatives from the Foreign Ministry, Ministry of Justice, IDFs legal office, (ii) meeting on August 9, 2006 with head of the strategic planning unit of the IDF intelligence, (iii) meeting on February 26, 2007 with Gil Haskal, head of NGO section at IDF. We also sent a detailed letter on January 8, 2007 to Defense Minister Amir Peretz requesting detailed information about the IDFs targeting practices. 157 IDF Spokesperson, Chief of General Staff: We have no intention of hurting Syria or the Citizens of Lebanon, July 28, 2006, http://www1.idf.il/DOVER/site/mainpage.asp?sl=EN&id=7&docid=55255.EN (accessed October 17, 2006). 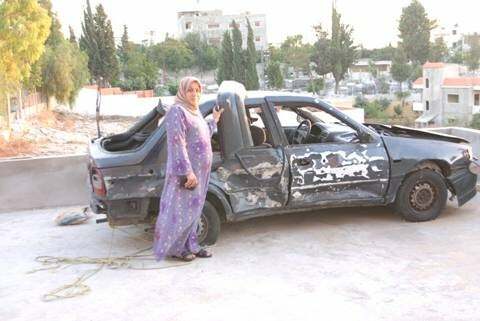 Four days earlier, on July 24, Halutz had commented that Bint Jbeil was a Hezbollah symbol, Ynet News, http://www.ynet.co.il/articles/0,7340,L-3280528,00.html (accessed November 6, 2006). 158 Itamar Inbari and Amir Buchbut, IDF: Hezbollah did not shoot down an Israeli airplane (צה"ל: חיזבאללה לא הפיל מטוס ישראלי), NRG News, July 17, 2006, http://www.nrg.co.il/online/1/ART1/450/601.html (accessed June 4, 2007). 159 Greenberg, Halutz: In the next speech Nasrallah will consider his words very well, Ynet News, http://www.ynet.co.il/articles/0,7340,L-3280528,00.html (accessed November 6, 2006). 160 See Human Rights Watch, Civilian Pawns: Law of War Violations and the Use of Weapons on the Israel-Lebanon Border (New York: Human Rights Watch, 1996); Human Rights Watch, Operation Grapes of Wrath: the Civilian Victims (New York: Human Rights Watch, 1997). 161 See Human Rights Watch, Civilian Pawns: Law of War Violations and the Use of Weapons on the Israel-Lebanon Border (New York: Human Rights Watch, 1996), p. 92. 162 Israel says world backs offensive, BBC News Online, July 27, 2006. 164 See Protocol I, article 57(2)(c). 165 See ICRC, Customary International Humanitarian Law, p. 65 (State practice indicates that all obligations with respect to the principle of distinction and the conduct of hostilities remain applicable even if civilians remain in the zone of operations after a warning has been issued. Threats that all remaining civilians would be considered liable to attack have been condemned and withdrawn.). 166 Israels Deputy UN Ambassador Defends Israels Attacks on Lebanon: We Cannot For Sure Prove That All Of The Civilians In Southern Lebanon Were Purely Innocent, Democracy Now!, August 24, 2006, http://www.democracynow.org/article.pl?sid=06/08/24/1425218 (accessed April 4, 2007). 167 See, for example, Rogers, Law on the battlefield, p. 100. 168 Human Rights Watch interview with Muhammad Isma`il `Abdullah, Marwahin, August 19, 2006. 169 Humanitarian agencies stressed throughout the war that there were no safe passage corridors for humanitarians or for fleeing civilians. Christopher Stokes, the director of Lebanon operations for Medecins Sans Frontieres, stated on July 31: For many days, the concept of humanitarian corridors has been used to mask the reality: it is impossible to get safe access to the villages in the south. The so-called corridor is a kind of alibi because in effect there is no real access for humanitarian organizations in the south. And the international community is deluding itself, if it believes it. MSF Field News, Christopher Stokes, MSF Director of Operations: Humanitarian corridor into south Lebanon is a delusion, July 31, 2006. Jakob Kellenberger, the president of the International Committee of the Red Cross, stated on August 10: The time for improved access is long overdue. Even life-saving, emergency evacuations so desperately needed are, at best, delayed for days. We also face enormous obstacles to bringing in aid convoys loaded with essential foodstuffs, water and medicines for trapped civilians. ICRC press release, ICRC President insists on improved access to southern Lebanon, August 10, 2006.The UN High Commissioner for Human Rights said that Many people are simply unable to leave southern Lebanon because they have no transport, because roads have been destroyed, because they are ill or elderly, because they must care for others who are physically unable to make the journey, or because they simply have nowhere to go. UN High Commissioner for Human Rights, High Commissioner for Human Rights condemns killings of civilians in Qana, South Lebanon, July 31, 2006, http://www.un.org/News/dh/infocus/middle_east/unhchr.htm (accessed April 6, 2007). 170 Human Rights Watch interview with Husam Ibrahim Haidar, `Aitaroun, September 19, 2006. Due to the terror activities being carried out against the State of Israel from within your villages and homes, the IDF is forced to respond immediately against these activities, even within your villages. We call upon you to evacuate your villages and move north of the Litani River. 172 UN Human Rights Council Commission of Inquiry on Lebanon, Report of the Commission of Inquiry on Lebanon, (Geneva: November 2006), para. 156. 173 Human Rights Watch interview with Sa`da Deeb Nur al-Din, al-Ghassaniyeh, September 18, 2006. 174 Israeli authorities have not provided a total figure of their strikes against Lebanon. According to the assessment of UN Mine Action Coordination Centre (UNMACC), Israeli aerial and ground strikes during the first weeks of the war used up to 3,000 bombs, rockets and artillery rounds daily, with the number rising to 6,000 towards the end of the war. See http://www.maccsl.org/War%202006.htm. 175 See Rogers, Law on the Battlefield, pp. 68-69 (land as a military objective subject to attack). 176 Yorem Dinstein, The Conduct of Hostilities under the Law of International Armed Conflict, (Cambridge: Cambridge University Press, 2004), p. 92. 177 Amos Harel and Avi Issacharoff, The Northern Command Ran Out of Targets, Haaretz, April 2, 2007. 178 Hamza Hendawi, Israel Targeting Hezbollah Infrastructure, Associated Press, July 26, 2006. 179 Statement by Ambassador Dan Gillerman, Israels Permanent Representative to the UN, during the open debate on The Situation in the Middle East including the Palestinian Question, UN Security Council, New York, July 21, 2006, U.N. doc. S/PV.5493. 180 Eli Ashkenazi, Ran Reznick, Jonathan Lis, and Jack Khoury, The Day After: The War in Numbers, Haaretz, August 18, 2006. Israeli authorities have not provided a total figure of their strikes in Lebanon, including the artillery barrage against villages in the south. According to the assessment of the UN Mine Action Coordination Centre (UNMACC), Israeli aerial and ground strikes during the first weeks of the war used up to 3,000 bombs, rockets and artillery rounds daily, with the number rising to 6,000 towards the end of the war. See http://www.maccsl.org/War%202006.htm. 181 Human Rights Watch visits to Dahieh, July 23, 2006; July 26, 2006; August 8, 2006, August 9, 2006; September 5, 2006; September 16, 2006; October 4, 2006; October 6, 2006; October 30, 2006; November 7, 2006. 182 Jad Mouawad and Steve Erlanger, Ferocity Raised on Fifth Day of Conflict, The New York Times, July 17, 2006. 183 Yaakov Katz, High-ranking officer: Halutz ordered retaliation policy, Jerusalem Post, July 24, 2006. The IDF spokespersons office later released two statements disputing the allegations. 184 Protocol I, article 52(2). 185 IDF Spokesperson, Summary of IDF operations against Hizbullah in Lebanon, July 13, 2006, http://www.mfa.gov.il/MFA/Terrorism-+Obstacle+to+Peace/Terrorism+from+Lebanon-+Hizbullah/IDF+operations+against+Hizbullah+in+Lebanon+13-Jul-2006.htm. 186 Human Rights Watch similarly found that a NATO air strike on the Serbian radio and television headquarters in Belgrade during the 1999 Kosovo conflict was unlawful, concluding: While stopping such propaganda may serve to demoralize the Yugoslav population and undermine the governments political support, neither purpose offers the concrete and direct military advantage necessary to make them a legitimate military target. Human Rights Watch letter to NATO Secretary-General Javier Solana, May 13, 1999; Human Rights Watch, Civilian Deaths in the NATO Air Campaign (New York: Human Rights Watch, 2000). 188 See Protocol I, article 57(2)(a). 189 Hezbollah officials told the Associated Press that around 250 Hezbollah fighters were killed during the war. See Sam Ghattas, Lebanon sees more than 1,000 war deaths, Associated Press, December 28, 2006. 190 Amos Harel and Avi Issacharoff, The Northern Command Ran Out of Targets, Haaretz, April 2, 2007. 192 See Chapter V below for a full account of the attack. 193 See Human Rights Watch, Civilian Pawns: Law of War Violations and the Use of Weapons on the Israel-Lebanon Border (New York: Human Rights Watch, 1996). 194 Human Rights Watch interview with Jamal Sa`ad, Bint Jbeil, September 26, 2006; Human Rights Watch interview with Hashim Kazan, Beirut, July 23, 2006.